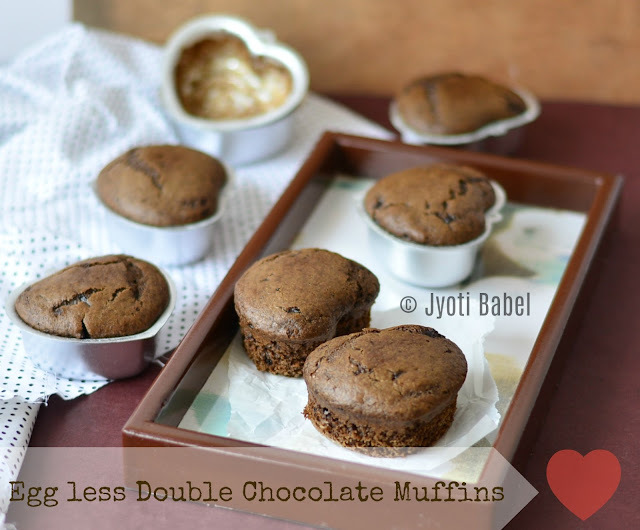 This recipe for eggless double chocolate muffins has been long due. It has been sitting in my drafts for some months now. Since I have been somewhat occupied with a new project, this food blog of mine is suffering from some lack of attention. Half of the first month of the new year 2018 has elapsed and nothing had been posted here till now. I decided that I need to do the needful today and this recipe from my drafts has come to my rescue. 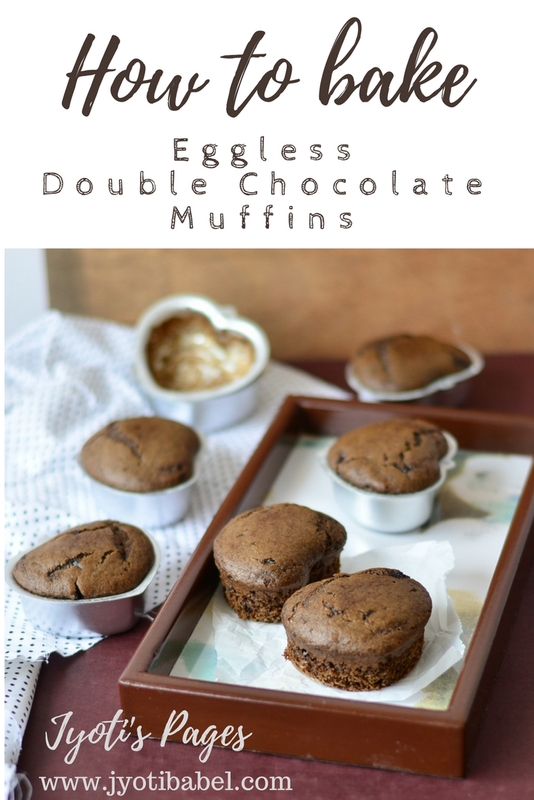 This recipe is a simple one and it is a healthy one as there has been no use of refined flour. I have used regular sugar, but you can go ahead and use brown sugar to make it even healthier and guilt-free. They go well with a cup of coffee. 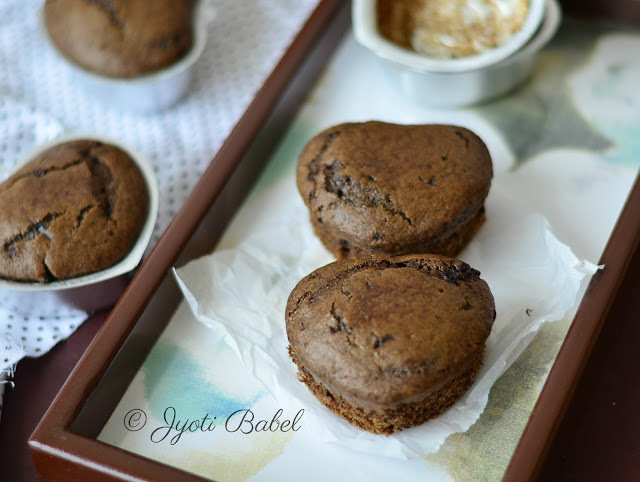 So, if you are planning a meet up with friends over coffee, this is one recipe you can try. Without much ado, let's learn how I made these wholesome and healthy eggless double chocolate muffins. 1. Line a 6 hole large muffin tray with paper liners or if you are using individual moulds like me, grease it and then dust it with flour. Shake off the extra flour. 2. Preheat the oven to 180 C. add a teaspoon of the floor to the choco chips and shake it such that they are coated with flour. This prevents them from sinking into the bottom while baking. 3. In a large bowl add all the dry ingredients – flour, cocoa, corn flour, baking powder, baking soda, and coffee. 5. Now add the dry ingredients to the wet ingredients. Add water to form a smooth batter. If you are using maida instead of whole wheat flour, you will need less water. So, do not add all the water in go, instead, add a tablespoon at a time. 6. When you get a condensed milk-like consistency of the batter, add vinegar. Add the choco chips to the batter and stir it once. Pour the batter equally into the prepared muffin tray or moulds. Just fill the mould till halfway; else the batter will overflow as it rises while baking. 7. Bake at 180 C in the preheated oven for 15 to 20 minutes. When done, a toothpick inserted in the centre of the muffin will come out clean. 8. Let it cool and enjoy with a cup of coffee. Linking this recipe with The SITS Girls Recipe and DIY linky. Looks tempting and easy to make Jyoti.